Last weekend, Dad and I went to the Gleneagles wood. 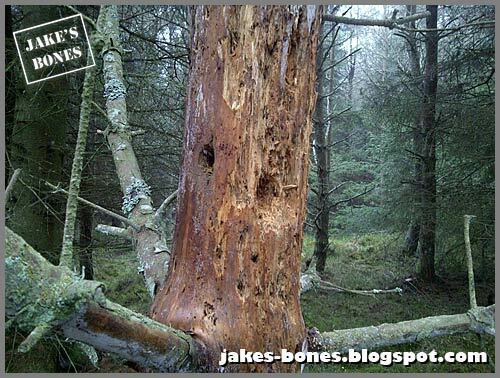 It is a dense pine wood with a two really big clearings which has lots of roe deer, buzzards and red squirrels. I have written about it before, but I have hardly been there this year. We went in the wood at the north-east corner, and went down the east edge, going quietly in case we saw any deer but we didn't. As we went into the clearing there was a buzzard which was being noisy overhead because we were near its nest. Then we went along the south edge and split up to search for bones as we moved west. 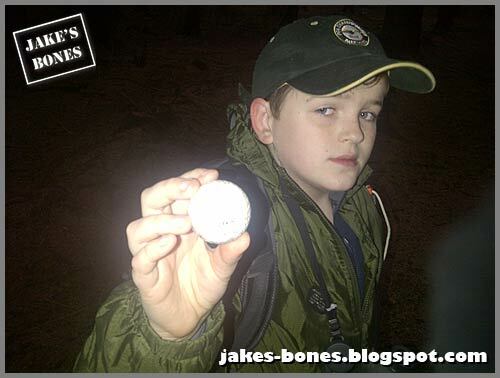 It was a golf ball ! The woods are near the Gleneagles golf course but you would have to be a very good golfer to hit it this far into the woods, and a very bad golfer to hit it in the wrong direction. Dad thought maybe a big bird, maybe a corvid, picked it up thinking it was an egg to eat. We kept walking on. Dad saw a red squirrel with moss in its mouth climbing a tree, maybe to add to its dray. Then we both saw this ! 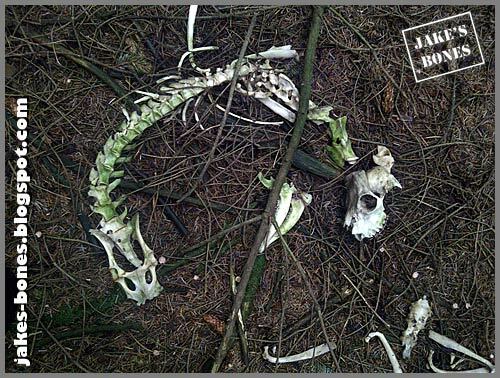 It was a roe deer skeleton with the whole spine from hips to head just as it died. It had some of the ribs and some of the sternum too. 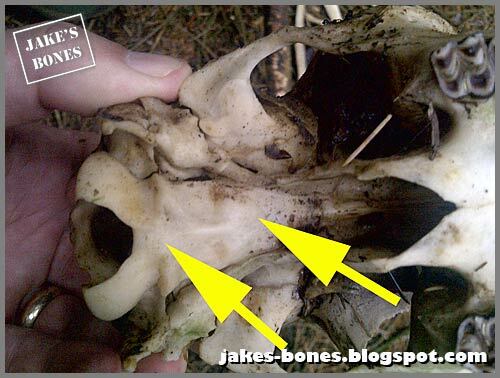 From the skull you could see it was a buck (male) because it had pedicles. The front of the skull before the teeth had been broken. 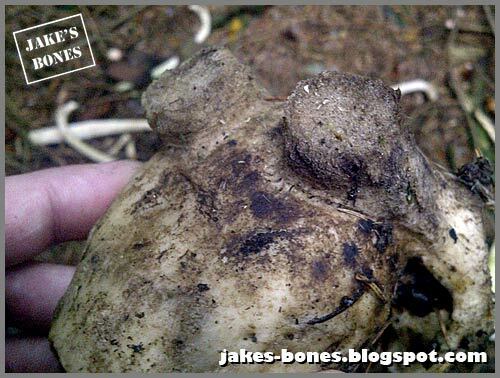 The pedicles were flat with no antlers. 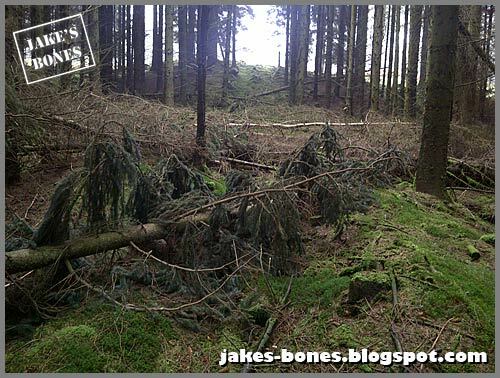 At first I thought they had been sawn off by gamekeepers or poachers, but they were rough, so they must have just fallen off. That happens in November for roe deer. Under the skull from the hole where the spine goes in to the nose was smooth. In young deer you can see cracks where the plates haven't fused, so this must have been an older roe deer. 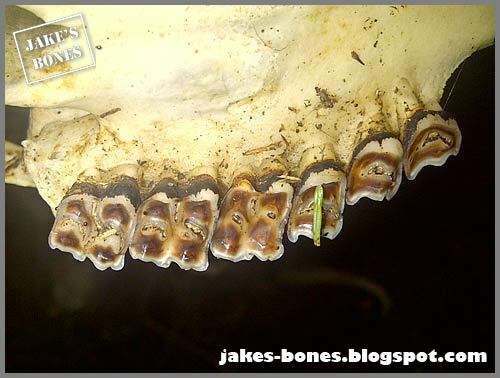 Teeth are a good way to see how old a roe deer is. The top cheek teeth were starting to wear down and get flat, showing it was old. The bones on the neck were starting to turn green meaning the bones had been there for a while. The edge of the bone you can see at bottom left is the atlas which is the top bone in the spine, and the first one you can properly see is the axis, which is the second bone. The ribs that were left were broken in places. Sometimes foxes do this when they eat the bodies. 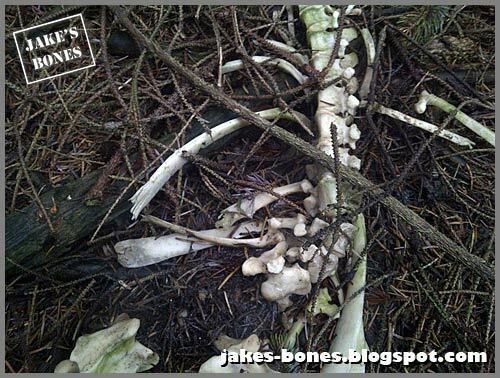 I found one of the back leg bones a little bit away. The is the joint where the thigh meets the knee in humans. 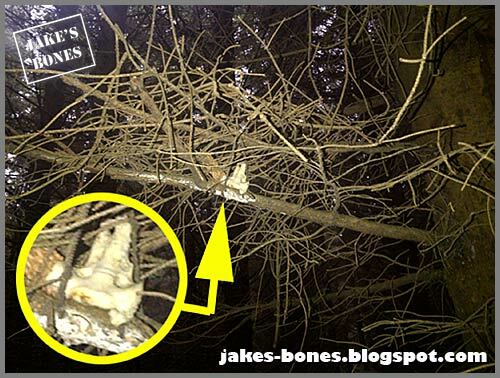 The left arrow shows there was still some muscle left on it, meaning it hadn't been a skeleton for very long. 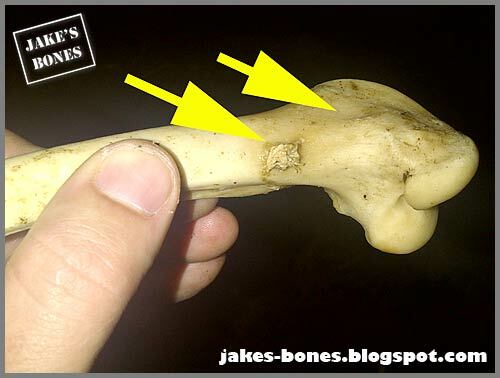 The right arrow shows the top of the bone was fused on meaning it was old again. 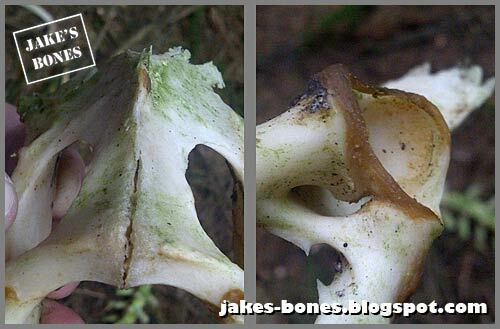 In young skeletons when the bones are still growing the top and bottoms just fall off. There were tufts of grey fur. 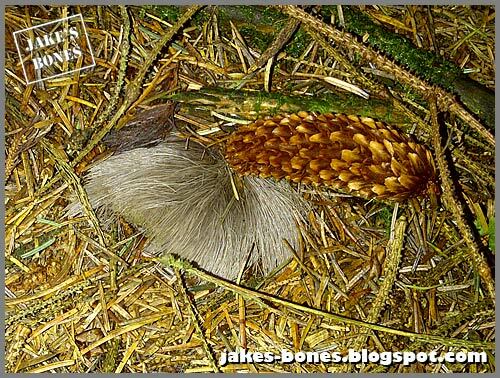 Grey fur in roe deer means it died in the winter. Dad and I split up again to look for the other legs, then dad spotted this at the edge of the wood ! It was the head and next of another roe deer but this one had antlers, and the antlers were very strange. Instead of growing straight these ones had bent back as if they were drooping. 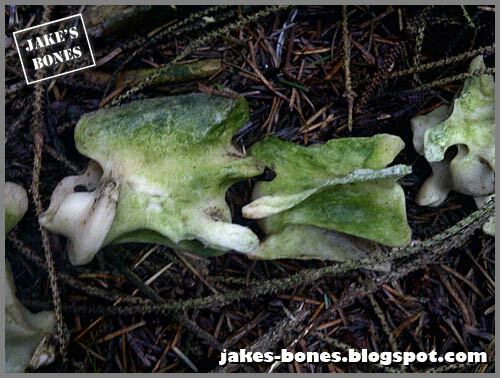 Although the antler bone was hard, this can happen when the deer is old, and it happens when the deer is in velvet and the antler is still growing. 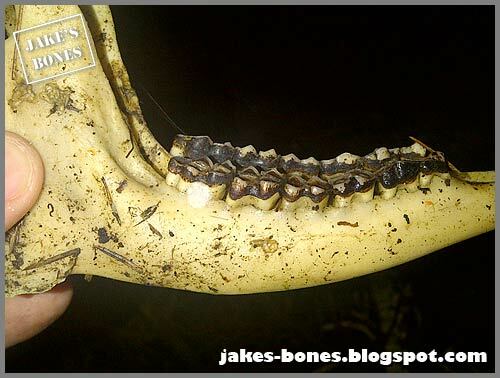 I wrote a little bit about strange roe deer antlers a few months ago, but this was a great skull so I kept this one and the bottom jaws too. 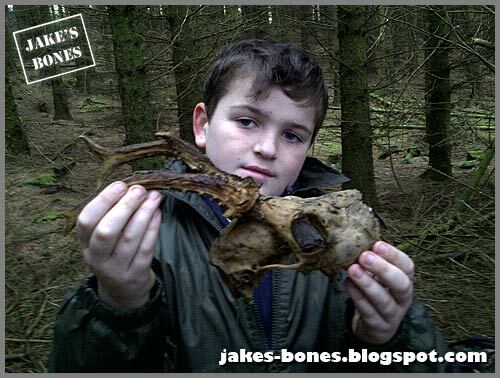 A bit further on I found this radius bone which is in humans is one of the forearm bones. 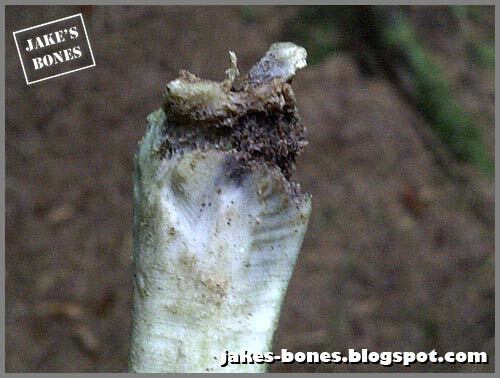 It looks like it had bone disease at one end, and you can also see where it had been chewed by maybe another deer for the calcium. There were lots of rotten trees, and I looked through a lot of them with my Swiss Army Knife looking for beetles. 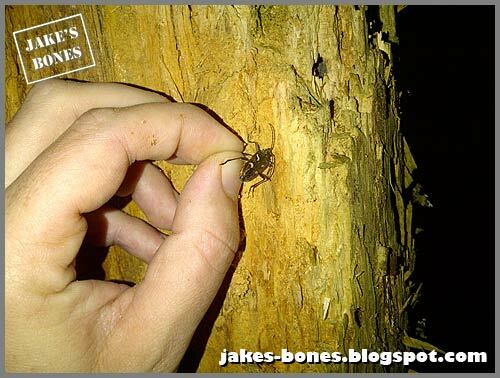 I didn't find any, but a few weeks ago I found a strange beetle in a pine tree on the moors near my house. This beetle tried to escape but we got a picture of it. 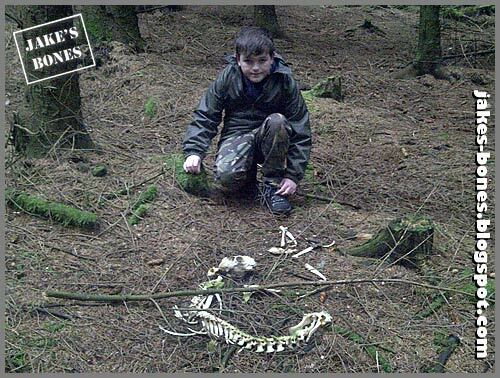 We couldn't work out what type it was so I asked my friend Mrs Powell who is a bone collector in England. 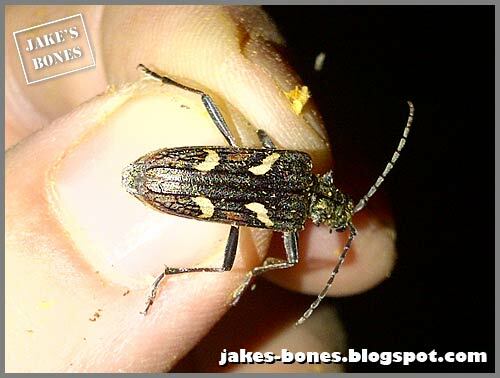 I thought it might have been a Wood Tiger Beetle but she worked out it was a different beetle called a two-banded longhorn beetle (Rhagium bifasciatum) which eat dead wood and lay their eggs there. 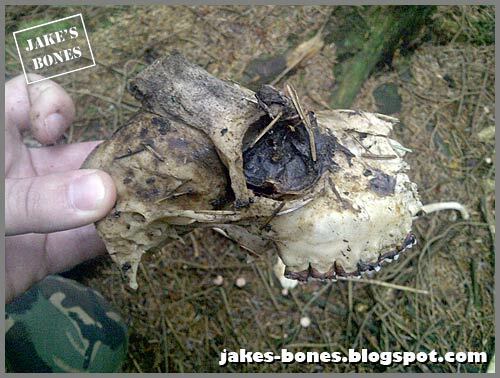 Although we didn't see any deer, it was still a great walk, and I am soaking the skull I brought back to start to clean it. Awesome blog... I learned a few things today! Thank you for sharing your knowledge, it is a pleasure to read! I found some bones but how do I tell if they are deer, cow, or even human? 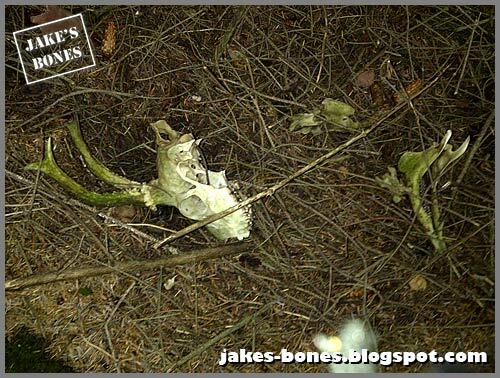 Strange bones #8: The Autumnwatch mystery ! Today I was filmed for BBC Autumnwatch !